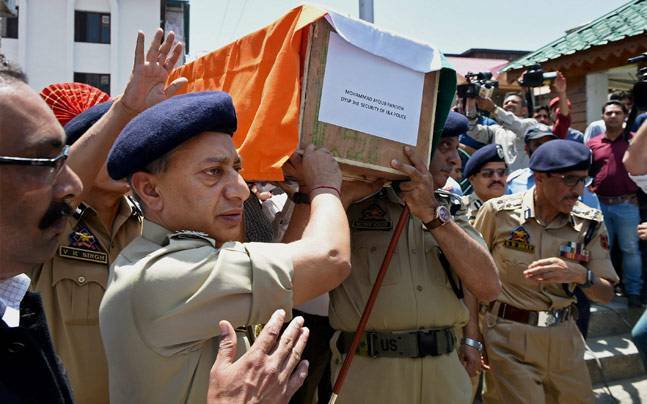 Srinagar (PTI): Three more persons allegedly involved in the mob lynching of Deputy Superintendent of Police Mohammad Ayub Pandith in Srinagar have been arrested, Jammu and Kashmir Director General of Police said here today. “We have identified 12 persons in connection with the case and five of them have been arrested,” the DGP S P Vaid told PTI. Yesterday, the DGP had said two persons were arrested, while another one was identified. He said the police have resolved not to spare the people behind the act. “It is the resolve of Jammu and Kashmir Police that we are not going to spare these rascals,” he said. The DGP said the investigation in the case is on and everything would be clear once the report comes. “Let the investigation complete, then only we can say what has happened,” he said. Asked whether moderate Hurriyat Conference chairman Mirwaiz Umar Farooq was present in Jamia Masjid when the incident took place, Vaid said, “The matter is being investigated”.